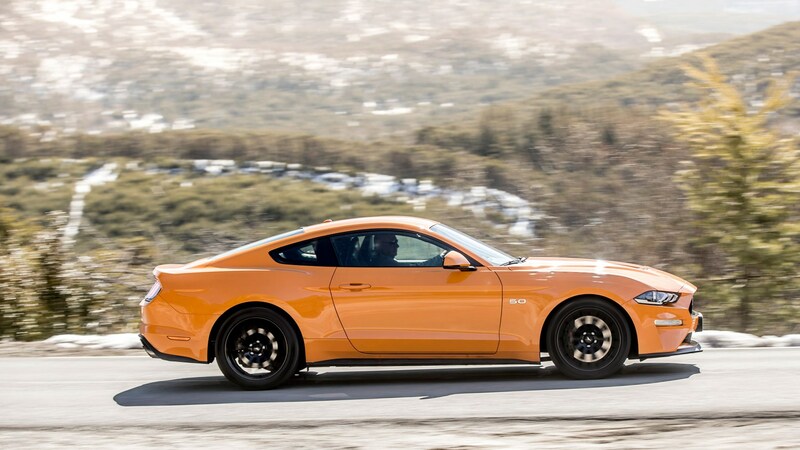 Ford got the 2015 Mustang so right it hasn’t gone crazy with the revisions at the mid-life refresh point you see here. But see old and new side by side and you’ll notice the 2018 car has lower-set headlights mounted between a bonnet whose leading edge drops closer to the tarmac. At the back there are small tweaks the tail lights and, er… that’s about it, visually. The folk at Dearborn have done plenty more under the skin, though. Like boosting the 5.0 Coyote V8 from 410bhp to 444bhp, engineering the adaptive dampers previously only fitted to the Shelby versions for use on regular Mustangs, and fitting a shiny new 10-speed auto transmission for people who don’t want to trouble their left leg. Tell you a secret: the Mustang doesn’t need ten gears. The only reason it has them is because Ford developed the transmission for the F-series trucks, which needs lots of cogs for trucky things like towing. It’s in the F-150 Raptor, for example, which you can read about here. Having said that, as anyone who’s been left miffed by the manual V8 Mustang’s gutless sixth-gear pull will tell you, the Coyote V8 isn’t the torque monster you might imagine, and in squeezing the extra power from it for this facelift Ford has pushed the torque peak 400rpm further round the dial. More gears means more time spent in the fun zone. This new ‘box is great match for the engine. A traditional epicyclic auto, its torque converter delivers that lovely smooth takeoff you just don’t get with dual-clutch transmissions. It’s snaps the changes home fairly promptly when required, especially in ‘drag race’ mode, which sacrifices refinement for ripping down the quarter. Zero to 62mph takes 4.3sec, and the wail from the (now-quad) tailpipes, at least with the optional sports exhaust kit, is so addictive you’ll want to keep banging the runs out to make sure. Not many drag strips on my local B road. How’s it cope with corners? If you’re asking if it’s the last word in chassis dynamics, then no, it’s not. 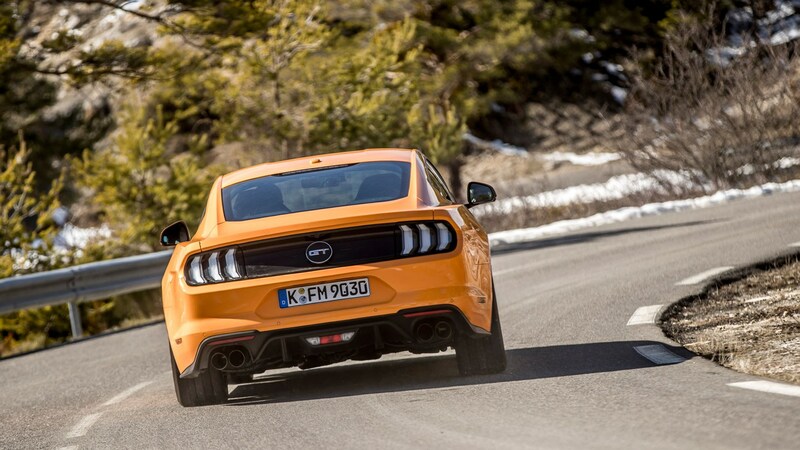 We drove the Mustang right after thrashing a state-of-the-art hot junior hatch and the Mustang’s steering felt about as energetic as a wombat getting off Qantas’s new non-stop Perth to London service. But overall, the Mustang is far better than you might expect. It almost… almost feels like it could pass for European, and revisions to the suspension – retuned dampers, a stiffer rear axle and uprated anti-roll bars – make it even better to drive. The big improvement though, is in ride comfort and composure on less than perfect surfaces. If you can afford the MagneRide dampers, which work on the same principle as the ones Ferrari uses, you should go for it. 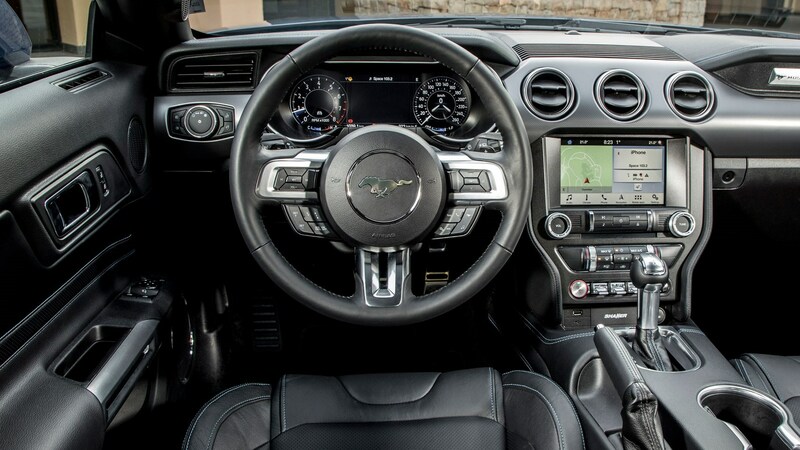 Ford’s tried to improve the interior’s budget feel with some new metal-look trim, but if you really want to distract your passenger’s attention from the crappy lower plastics, show them the new 12in digital instrument cluster, which can be configured to show far more info than you’d ever need. Less cool, but more useful, is the extra safety kit now fitted. Pre-collision assistance, pedestrian detection and the availability of features like adaptive cruise should help improve on the old car’s terrible two-star (later upgraded to a still-shocking three) Euro NCAP score. 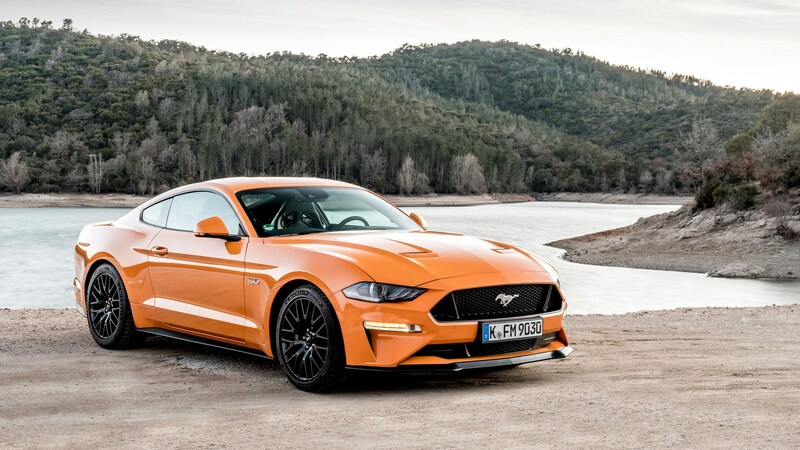 Oh, and the entry level 2.3-litre four-pot Ecoboost Mustang is still available, though it’s now rated at 286bhp instead of 315bhp, but does get 6lb ft more twist. It’s yours from £36k. Just don’t expect it to sound like a V8. Ford’s done far more to the Mustang than the styling suggests, but it’s still a leftfield choice. The back seats are cramped, the interior plastics are sub-European and the V8’s poor 23mpg average is as retro as the styling. And while it looks strong value at £43k, it’s worth remembering that when the Mustang first arrived here it cost almost £10k less. And have you noticed how much of the good stuff is optional? The digi dash, the sports pipes, the trick dampers and the 10-spd auto 'box are all extra and help make this a near-£50k car. That said, it looks and sounds spectacular and it’s genuinely fun to drive, whether the road’s straight or twisty. But most of all, it’s got real personality. And that’s not easy to come by in modern cars.